Soak dried shiitake mushrooms in warm water for 1/2 hour before slicing them. Slice the rest vegetables thin strips (julienne) and chop the garlic fine. Mix corn flour with some cold water, then boil some hot water and pour in a little at a time, stir until it become thick starch. Heat oil and fry garlic until light brown then add in all the vegetables, light soya sauce, vegetarian oyster sauce, salt and pepper, continue frying for 2 minutes. Add in water and leave to cook for 10 minutes, strain away all the sauce and cool down the vegetables. Spoon a small amount of vegetable filling onto the center of a spring roll skin. Fold 3 corners, brush the open corner with starch made from corn flour and roll the spring roll to seal it.. Continue doing that until all the spring rolls are done. 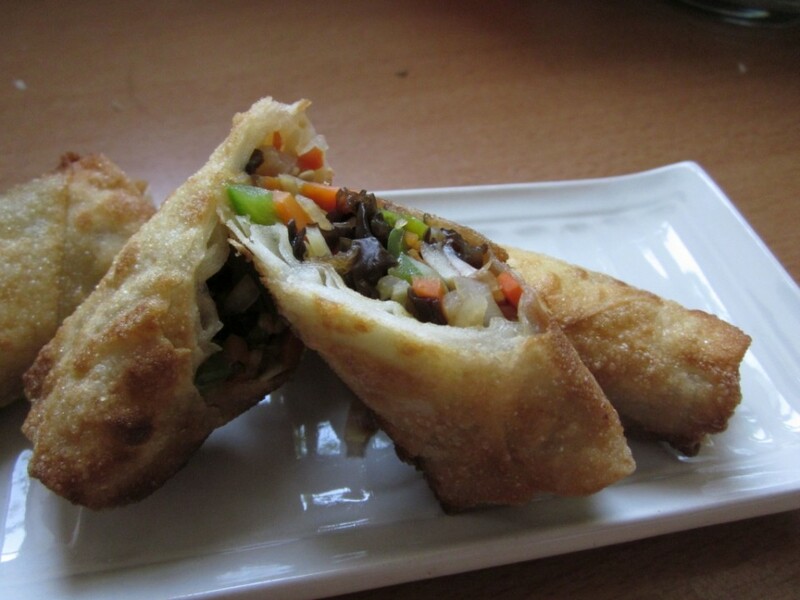 Deep fry with oil, make sure oil is hot so that the spring roll skins can be crispy.